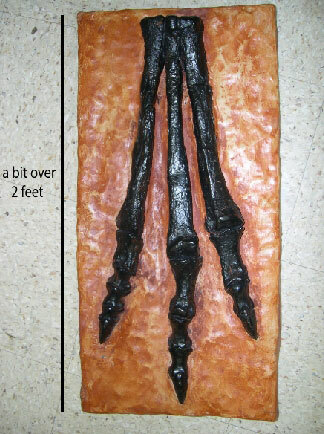 Foot bone cast of “Arkansaurus fridayi,” the only known dinosaur found in Arkansas. The remains of a right hind foot were discovered in Sevier County in 1972. Photo courtesy of Arkansas Geological Survey (all rights reserved, used by permission). Arkansaurus fridayi fossil; Photo by [file:field-file-photographer]/[file:field-file-source] ([file:field-file-license]). Arkansaurus was a bipedal dinosaur whose fossilized bones were discovered in Sevier County in 1972 (the fossil remains of a right hind foot were discovered in Lockesburg, Arkansas). According to the Encyclopedia of Arkansas; "The foot bones of “Arkansaurus fridayi” are the only dinosaur bones found in Arkansas that have been brought to the attention of the scientific community. The bones were found in Early Cretaceous age rocks from approximately 146 to 100 million years ago." Fayetteville student Mason Oury began working on the effort to have Arkansaurus fridayi declared official state dinosaur in 2013. He ran a creative campaign that included social media, a website, a podcast, and outreach to media and legislators to promote support for the legislation. His efforts were rewarded when Governor Hutchinson signed the resolution in 2017.